Leaving campus the way it came in—amid a swirl of shifting plans and controversy—seems to be the modus operandi for Rice University’s Martel Center, more colloquially known as “the Art Barn.” After reports last month that the building would be demolished, Rice University changed its mind and announced that it would, instead, relocate the historic structure to the Fourth Ward area of Houston, just west of downtown. The Art Barn has graced Rice University’s campus since 1969. Originally conceived by John and Dominique de Menil as what was meant to be a quick-fix housing solution for their prestigious private art collection, the squatter became father to a generation of its kind, and established itself as a cultural mainstay not just within the university, but the community as a whole. The Art Barn was never meant to be more than a temporary safe haven during a turbulent time. The Menil Collection, which boasts over 15,000 pieces of art—including originals by Picasso, Duchamp, and Matisse—sought a sanctuary for their darlings after facing rising tension from original host, St. Thomas University. The resulting structure, which was dubbed the Menil Museum, and its “twin brother,” the Rice Media Center, were built out of a corrugated metal known as galvalume, a metal siding that was affixed to a wooden frame. This design spurred Houston’s West End “tin houses,” a 1970s movement named after the building’s noticeably atypical siding. 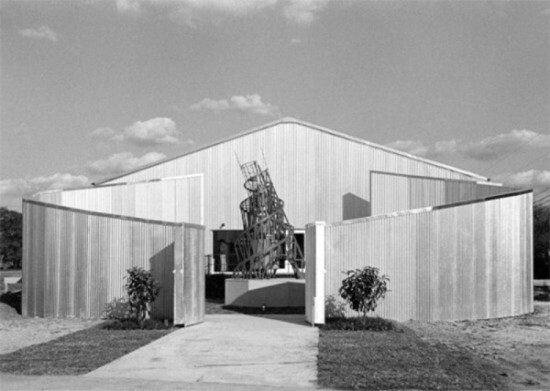 These inexpensively constructed modular buildings sprouted up throughout Houston shortly after the Art Barn was built. They often played fundamental roles in the community art scene. Although the Art Barn was not the original tin house, it was, perhaps, the most predominant forerunner of the movement, as it was a highly visible fixture due to its stark contrast with Rice’s surrounding masonry buildings. The Art Barn’s 1968 inaugural exhibition, The Machine as Seen at the End of the Mechanical Age, attracted tens of thousands of visitors before going on to enjoy a three-month residency at MoMA. In 1969, Andy Warhol’s Raid the Icebox also showed at the space and went on to achieve renowned fame. 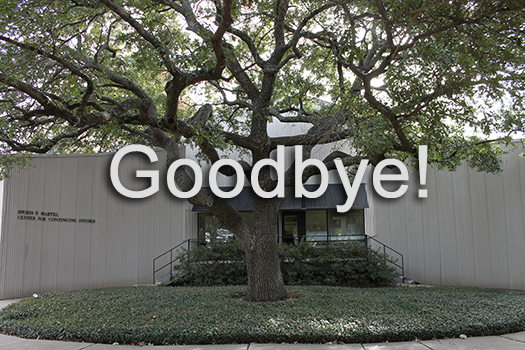 The space remained open to the public and free until 1986, when the de Menil Arts program was relocated. However, the Martel Center (as it was renamed) continued to act as host to art shows, classroom and office space, and was the home of Rice’s Glasscock School of Continuing Studies. Now, the Art Barn is being removed due to alleged safety problems and the potential cost of renovation, although there is some controversy over the validity of these claims. The building was never meant to be permanent, argue the defenders of its removal. Its very mode of construction asks that it be taken down. Naysayers, however, are less convinced, citing other cases where historical structures have been recycled for new purposes. Photography professor Geoff Winningham calls attention to the fact that the space could easily function as much-needed studio space, and points out that Rice’s forthcoming art center will not be completed till 2016. Until then, a simple green lawn will memorialize the removal of the campus treasure, as will the live oak tree planted by Warhol on the site after the Raid the Icebox show. Many hope the relocation and repurposing of the building to Houston’s Fourth Ward, where it will act as an art center and contribute to Houston's rise in culture, will ease the blow to the aggrieved arts community. Rice’s Visual and Dramatic Arts Department organized a last huzzah for the beloved space in February, during which they invited commemorators to bring picnics, music, and any other modes of expression they wished to share.